I know I’ve mentioned it before, but I really, really like introducing people to new music. I like to discover that unique little element that will endear a song or a musician to them as soon as they hear it. I want to help them hone in on their next favorite thing. Sometimes I fail completely…I think I have my finger on it and am utterly wrong. That’s cool though, because I can keep trying. Sometimes, however, sometimes I hit the nail right on the head and create a monster of obsession. I’ve done really well over the last week. Like patting myself on the back well. First, I have a colleague who is of a similar age and position in life (thirty something, two daughters almost exactly the same age as mine, working full time in disaster response) whom I didn’t know well, but always enjoyed being around. We were on the same workgroup for a project recently and got to talking about music during a forced lull. The man loves rap. Like really loves running through his suburban neighborhood blasting old school stuff on his headphones to feel young and cool again. One thing led to another and now he’s both feet into Bewhy. I started him off on the newest EP, ‘The Blind Star’ (an absolutely fantastic example of music at its best…definitely listen to it) and now he’s digging through some old stuff to find even more… along with other Korean artists I’ve recommended. The second major success is a bit closer to my heart for a couple of reasons. First, the person I have wooed is Ms. Kchat herself, our own Stephanie. One has to be very deliberate in how they introduce Stephanie to something new. Even if you absolutely KNOW that it will be her favorite thing, you have to go slow…’Hey, you might like this thing, you should try it sometime…here’s the link.’ If you push it, it will never happen. Then, when she’s riding in your car, you play the song…she’ll like it and may even ask who it is, but it’ll end there. And one day, out of nowhere, she’ll discover it. It’ll be from your link and she’ll know that it was from you, but she’ll fall into it like the world suddenly needed it to happen and she will be completely invested as if she’s the number one fan girl of all time. When it finally happens, as it did this week, it’s glorious. The second reason this particular match is close to my heart is because of the artist himself. 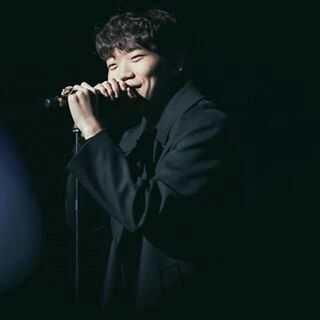 I’ve written about Changmo a couple of time for Throwback (Musical) Thursday, and he has ranked as #1 rapper for me for a long, long while. It was recently that someone, a person to remain nameless, mentioned in a chat group that he wasn’t a very good looking guy. I felt my entire body tense up. I felt my blood pressure rise. I argued. His eyes. His smile. His thighs. His voice. I think I won the argument. It was also brought to my attention that my quest for an Ultimate Bias (UB) has been pretty much ridiculous…that Changmo is the KLove of my life. It clicked. I felt a huge sense of weightlessness, of relief. He had found me and I had finally recognized him for the role he plays in my world. I won’t go too much into it as this step in our relationship is relatively new and tender, but just know that it’s there. No gifts are necessary, our love is all we need to survive. After weeks of slow progression, I have finally gotten Stephanie and my UB together. And together they are. Pretty sure if I wasn’t into sharing, making sure my Kloves get all the love they deserve, she would be hiding the fact that her ears lust after him all day at work. That she would never tell me that she replaced her broken headphones mostly to listen to the album ‘Gettin Money Moment’ over and over and over. There are a couple of super hot lines that require being repeated at least three times with each listen. The best way to experience Changmo is through fan videos. He is marvelous on stage, how he interacts with the crowd, how he is always smiling, and how he commands everyone’s attention at all times. He’s funny, talented, engaging, and (I will cut a man for disagreeing) exquisite to look at.